The longest standing benefit offered by CFFC is our Hospital Help Packets. This program was envisioned by, and is currently run by, individuals who understood the anxiety and frustrations of hospital admissions. We hope to ease the stress of those (inevitable) times by providing a supply of parking passes and a small stipend to escape the routine of a hospital stay. When available, we also include coupons for local eateries. Normally, t he packets are prepared by volunteers at their homes and delivered to the hospitals. But, if necessary, the packets might be assembled in the hospital by family members while awaiting admission. 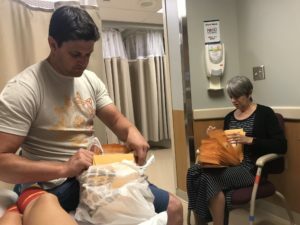 The picture shows Rick Doherty (CFFC vice president) and Sherry Tice (mother of CFFC president Kori Tolbert Doherty) putting the finishing touches on a supply of packets for Highland. You can also catch a glimpse of photographer Kori’s Wonder Woman socks. If you do not receive a Hospital Help Packet in the first day or two of an admission, please request one through: the nurses at Golisano Hospital or the RTs at Highland Hospital.